It is not easy for digital cameras to render rich red tones. I've tried to make these photos as true-to-life as possible, but nothing can replace the vivid yet subtle hues in real scarlet Banksia flowers. Banksia coccinea is another one of those plants described by prolific Scottish botanist Robert Brown, all the way back in 1810. The species is common along the south coast of Western Australia between Albany and Esperance, and as far inland as the Stirling Ranges. With the exception of the spine bill and wattlebird photos, the rest of the images on this page were all taken at the Stirling Ranges where flowering was apparently particularly good this year. A Western Wattlebird does the scarlet Banksia dance. Note how orange the face of the wattlebird is - the features are all grey but the face is covered in pollen from feeding on the Banksia flowers. Birds such as these and other honeyeaters, as well as some insects, are likely to be primary pollinators of this Banksia. Like many Banksias, B. coccinea plants are killed by fire but regenerate after fire from seeds. B. coccinea plants can reach flowering as quickly as 2.5 years after seed germination, and often die before they reach 20 years old. They are also vulnerable to the effects of root rot (Phytophthora cinnamomi), an invasive pathogen which has caused widespread dieback of many Banksias in Western Australia. 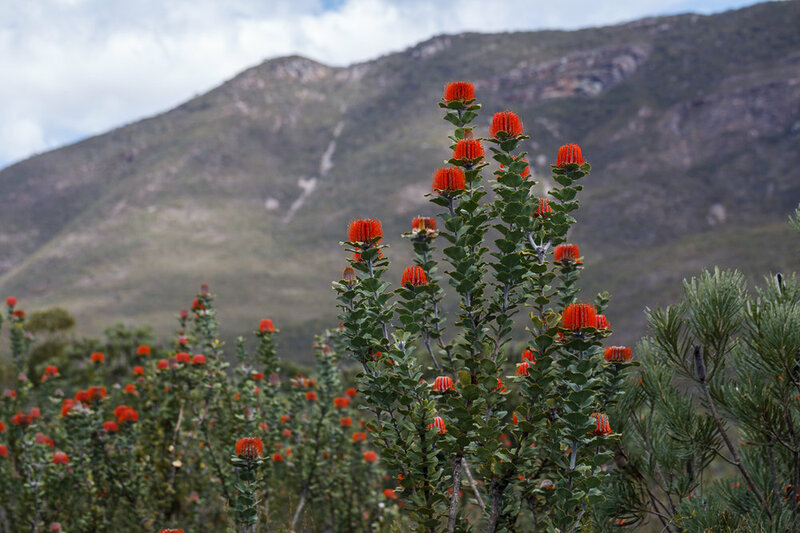 Banksia coccinea flowering en masse in the Stirling Ranges. The Stirling Ranges provide a dramatic backdrop to this amazing stand of Banksia coccinea trees. It seems to me like the Banksias are holding up their flowers like colourful gifts, or like very colourful candelabras.